The ability to imagine and create is not merely the capability to be colorful, whimsical or optimistic, but to SEE through the darkness, and be a light when none other is shining. 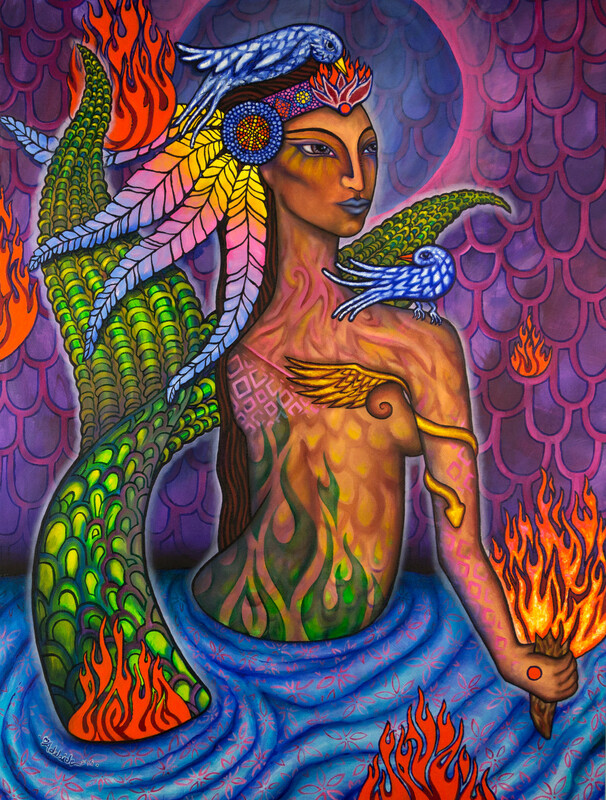 Native Naga is a “way seer,” who personifies this wisdom and holds the torch with comfort. Her heat is warm enough to attract the coldest of hearts and powerful enough to burn a moth filled with desire. Creature of the intuitive night, 'Native Naga' is bright enough to navigate through the darkness and see it ALL. She expresses the spectrum of emotions, colors and elements. She's a part of the water, earth, air, and fire. She embodies the lineage of the Mayans, Egyptians, Mesoamericans and native tribes who’s spiritual path includes ritual and respect. This piece is especially close to Adelaide as her mother and father helped a group of tribe members cross the border of Mexico while she was in utero. The native questers blessed fetus Adelaide while they used her parents home as a temporary shelter on their barefoot path to return a burning torch to a statue of Cuauhtemoc in LA. They were honoring the end of “500 years of darkness” that passed since the Spaniards killed Cuauhtémoc who prophesized that the gold was in our hearts and that in 500 years the new sun was coming. Native Naga weaves Adelaide's story to the stories of all the ages. Her femininity reminds us of the softness on the outer edge of a deep inner strength!